Manx rates, which are currently calculated using a property's rental income in 1969, are "out of date and unfair," a minister has said. 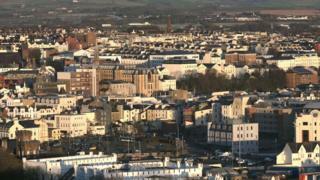 Tynwald has launched a consultation on an update to the system which would see rates "based on property size". A 2015 government survey found only 38% of respondents understood the existing method of rating. Policy and Reform minister Chris Thomas said there was a need to create an "appropriate and fair system". The new plans would see rates based on property size, which would take into the account the area of all a building's floors, with software being used to measure each individual property. Referencing the 2015 consultation on Twitter, Ramsey MHK Lawrie Hooper wrote that having second one within four years was an "absolute sham". However, Mr Thomas said the new survey would help the move towards an "appropriate and fair system". "Keeping the rateable values up to date would be easier and cheaper, so we wouldn't go nearly 50 years before the next comprehensive review, as has happened," he added. The eight-week consultation, which also asks for views on the unequal distribution of non-domestic rates around the island and the use of domestic properties for business or charitable reasons, runs until 21 April. The results will be published ahead of a debate at June's sitting of Tynwald.